Welcome to the Luau, discover more in the Tikki hut for this Hawaiian themed classic. Aloha! is a more expansive game, possessing a non-standard sixth reel which means for free spins and bigger bonuses. You will also be serenaded with some lovely tropical music that will have you feeling like it’s summer in Honolulu. Don't wait for too long and play UK video slots here. 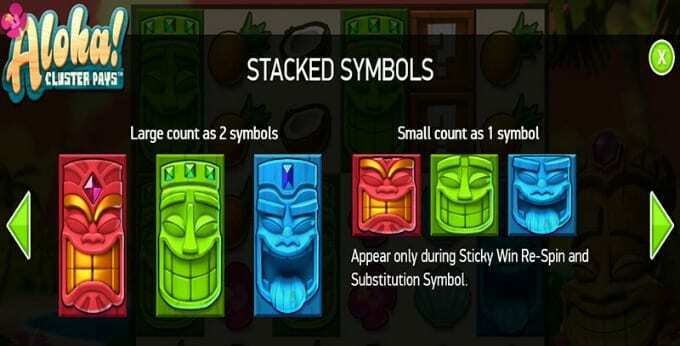 If you are an online slots player looking to learn more about a new game then why not try Aloha Cluster Pays! 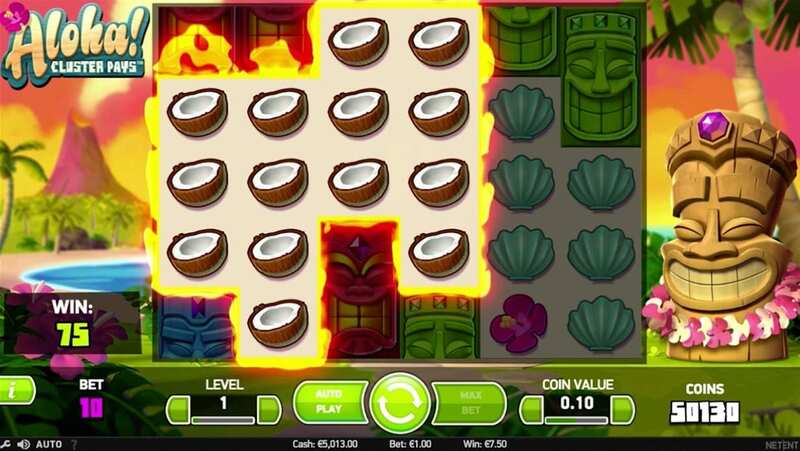 The game takes you on an exciting journey to the Pacific Islands for a fun packed exotic adventure. We have taken the time to pull together the game details and information for you here so please read on to find out more. The game has been brought to you by the established and popular spin slot games maker Net Entertainment, so you know you’ll be getting top quality, premium technology and graphical display. The gaming experience is action packed with all the best content and bonusing capabilities. Net Ent has a history of producing games with great user-experience and a fun element that not many can rival. The game is far from standard and offers a rare structure with six reels and five rows. The unique element of the game is, without doubt, the fact that there are no standard pay lines. Instead, wins are achieved by clustering together horizontally or vertically 9 or more symbols. There are many ways to enjoy the best new slot games and we have already listed how. The minimum stake for the game is £0.10 and the maximum bet is a whopping £200 meaning some significant payouts can be achieved if you are a lucky winner. Please always remember to gamble responsibly though and do not spend beyond your means. As mentioned the game developers have brought you a taste of the Pacific Isles and plenty of traditional Fiji customs such as dancing, dazzling necklaces, and happy statues. The volcanic backdrop exudes a sense of danger and thrill-seeking and similarly, the music complements this by adding an air of tension to proceedings. Wild spins that aid your chances of achieving more winning outcomes via symbols that substitute in and replace almost all other symbols on the reel. The wild symbol is, in fact, a wooden crate containing a question mark – the only symbol that it doesn’t replace is the free spins logo so it can be very very beneficial for you indeed! Speaking of free spins, Aloha Cluster Pays has plenty to offer and they have activated automatically so watch out for them appearing on the reels. When more than 3 appear you can win 9-12 free spins at a time so it really is a great feature. As you play more and more you’ll notice how often the free spins feature is triggered so keep a lookout as the more often it is triggered the more chances you have of winning. 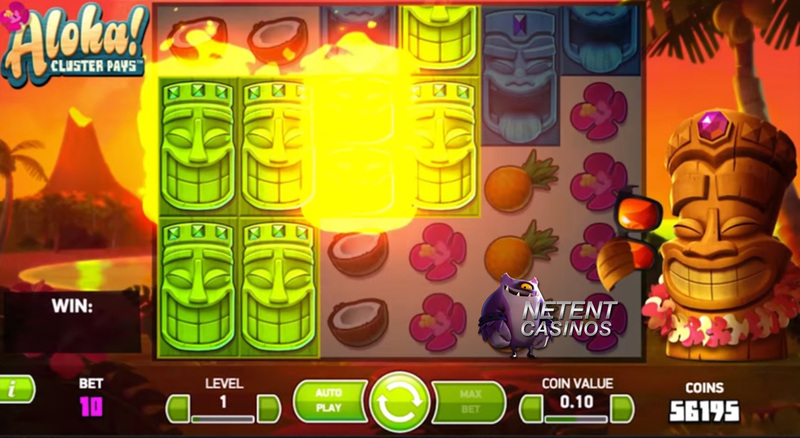 This game will certainly appeal to most UK slot players as it is a fun-filled game with ample exotic charm and daft characters. The theme is laid-back and relaxed and definitely lends itself to those that are looking for a new game to play that doesn’t take itself too seriously. It’s different enough to feel like your experiencing something new but it’s not so radical that it will complicate and deter. We think it’s an excellent game so why not try for yourself! Another stomping game to have a play on is twin spin.